The Guardians of Gallifrey | GoG BLoG | News and information from the world of Doctor Who. Just celebrated Easter with fellow Doctor Who fans at the Guardians of Gallifrey meeting. The discussion and video selection inspired a trivia contest which will, no doubt, show up at a future meeting. You can try it now, below (answers in next week’s blog post). For questions 1 through 13, in keeping with the Easter theme of resurrection, name in order the televised story in which each of the Doctors regenerated. Hint: questions 1 and 11 will have a part a) and part b), and don’t forget the War Doctor. 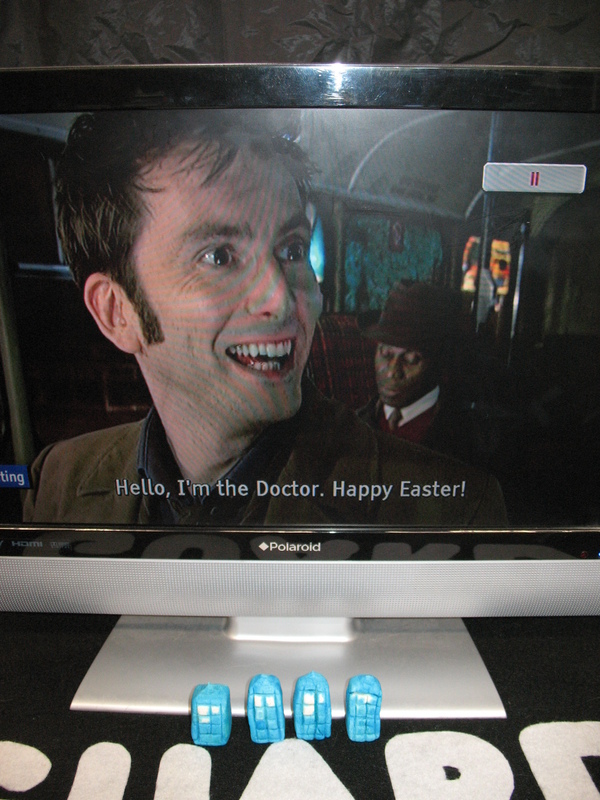 The last three questions are for bonus points: Name the episode in which the Doctor talks to a bunny; name the episode which takes place on Easter; and name the episode that includes an Easter hymn. 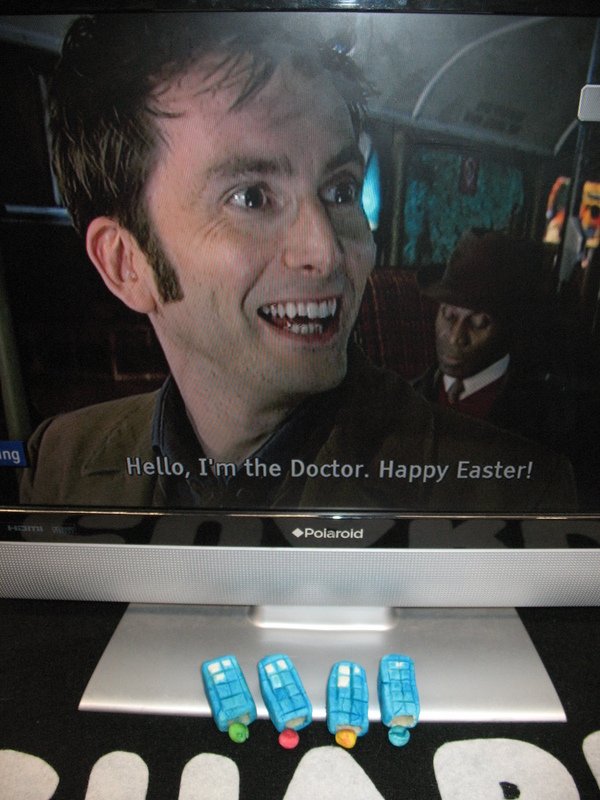 And if you were wondering what the little TARDISes had to do with Easter, think Easter egg hunt. David Tennant, who has lent his voice to numerous other audiobooks, including Cressida Cowell’s The Wizard of Once, will narrate H.G. Well’s The War of the Worlds. Five of Well’s works will be released as “a special audio collection” on Audible April 11. Doctor Who Series 11 Art Director Dafydd Shurmer was promoted to Production Designer. Shurmer has been an Art Director on many productions including Sherlock. A different Production Designer, Darryl Hammer, was in charge of the portion of the production filmed in South Africa but it appears Shurmur is now the main Production Designer for the series. It appears there was a prop pram with a prop baby inside it as part of the street scene (with a great quote!). Several fans were able to take selfies with the three stars who play the thirteenth Doctor’s companions, Graham, Ryan, and Yasmin. At the Cory’s Building on Bute Street in Cardiff, Wales on Monday, March 18 fans snap a selfie with thirteenth Doctor actress Jodie Whittaker. Cardiff March 19 the Glamorgan Building of Cardiff University was set-dressed a park in Paris. Walsh was photographed as he was leaving Barry Island. A New Look for the DW Cast? 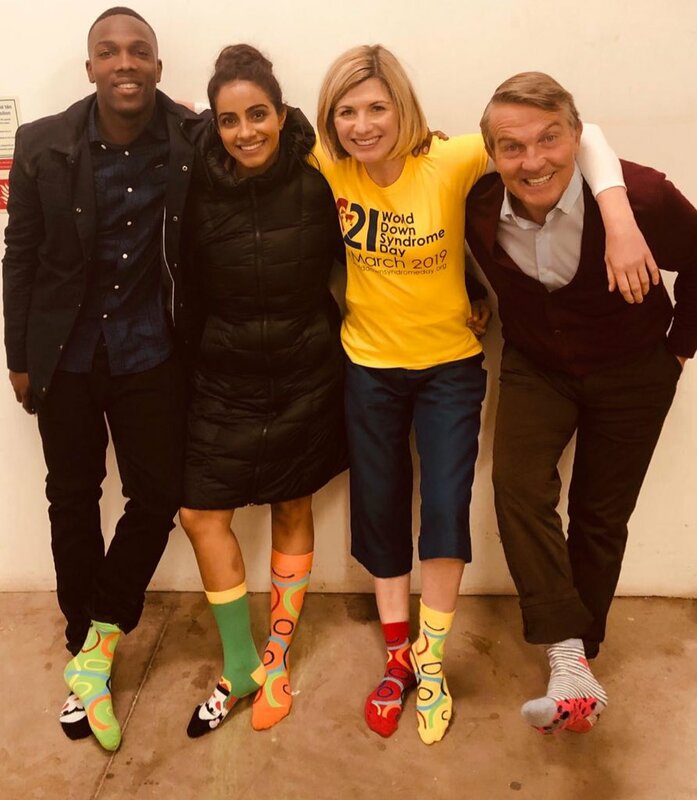 The Doctor Who cast, Jodie Whittaker, Bradley Walsh, Tosin Cole and Mandip Gill in a photo shared by Shabang Theatre on Twitter. Do you know what thinking is? It’s just a fancy word for changing your mind. I hate computers and refuse to be bullied by them! I just want to tell you, you were fantastic. Absolutely fantastic. And do you know what? So was I! Somewhere there’s danger, somewhere there’s injustice–and somewhere else, the tea is getting cold. 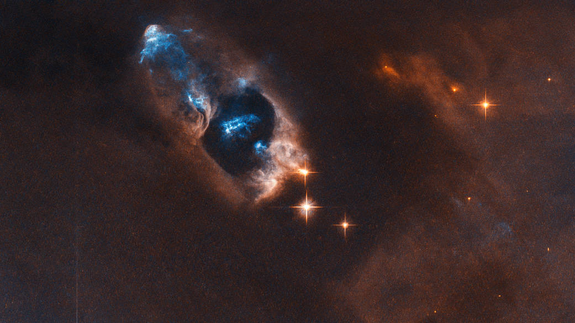 There’s always something to look at if you open your eyes. Welcome to what I presume is your first alien planet! Don’t touch anything. To see an impromptu performance from today’s St. Patrick’s Day meeting, check out our Facebook page! 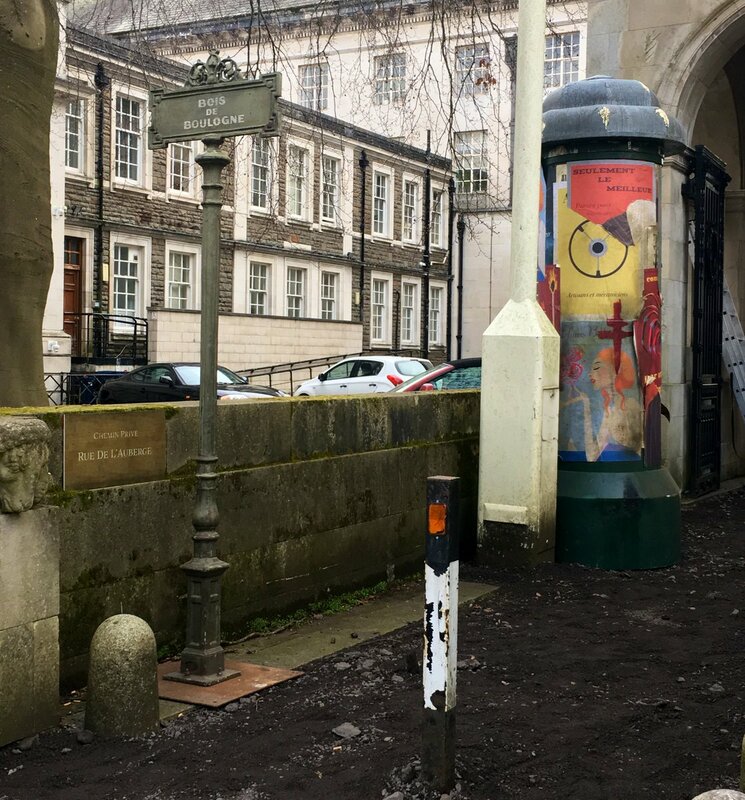 A large section of Cardiff Bay Link road in Cardiff, Wales was closed off for Doctor Who filming February 10 for a late night shoot. One person at the scene captured a photo of the filming involving automobiles, one with a camera mount. The shoot was described in a fan’s tweet as within the Cardiff Bay Link road tunnel, and the area outside by the Queensgate roundabout. There was also a report of “seagulls” at the location, (or large birds resembling seagulls) “floating” in the air. It is possible these were actually drones mounted with cameras. An ambulance cot prop was spotted with the TARDIS, which was seen in the Lord Mayor’s reception room in Swansea Guildhall. A prop plaque on the wall states: “In honour of those members of the Secret Intelligence Service who gave their lives in service of queen and country.” Film crew members’ names are included in the list of the deceased, among them, Catherine Goldschmidt, cinematographer for the first filming block. More plaques with earlier and later dates were spotted with more names of the film crew. One Tweet (since deleted) listed the name of screenwriter Gareth Roberts on a plaque honoring Secret Service members who died after 2000. A prop sign on a door read Chief of the Secret Intelligence Services and a directional sign pointed to the Cyber Security Department.